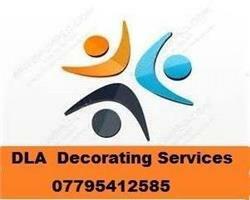 DLA Decorating Services - Painter/Decorator based in Godalming, Surrey. DLA Decorating Services are a reliable, professional business dedicated to designs and finishes of the highest quality for the customer, We are a well-established and respected company with over 14 years experience in the industry. We are based in Surrey and cover SW20, SW19, SW18, SW17, SW16, SW11, SW6,Wimbledon, New Malden, Surbiton, Kingston Upon Thames, Hampton, Ham, Richmond, Putney, Fulham, Battersea, SW London, Weybridge, Walton On Thames, Epsom, Esher, all GU postcodes areas, Guildford, Woking, Surrey and surrounding areas. Whether you are looking for interior or exterior painting services or require a domestic or commercial refurbishment, DLA Decorating Services have the expertise and experience to get the job done on time and to the highest standards. From the pre-paint repairs through to completion of your refurbishment projects, our friendly and efficient staff are with you every step of the way to make sure everything runs to plan. We offer free no obligation quotes and estimates, and happy to offer discount for Senior Citizens. NO JOB TOO SMALL. !!! Cover Godalming, SW20, SW19, SW18, SW17, SW16, SW11, SW6, Wimbledon, New Malden, all GU postcode, Guildford.